Congratulations to Darci Bayney of Zona Farms on the purchase of Quailhurst-bred “Deluca.” Deluca is a two year old, elegant, chestnut KWPN/NA mare sired by Quailhurst stallion Nassau, 2005 KWPN Horse of The Year. 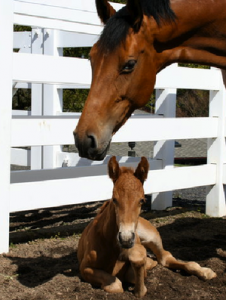 Her mother/dam Shakira is by Holsteiner stallion Cheenook and grandsire Caretino. Already showing tremendous athletic balance over fences and grace in her movement, Deluca and Darci will certainly be a pair to watch in the future. We wish them all the very best together. 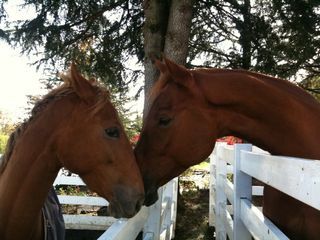 Fitch says goodbye to Deluca on the day of her departure from the farm.